As emails come in, our spam-filter will determine whether the email is legitimate or not. 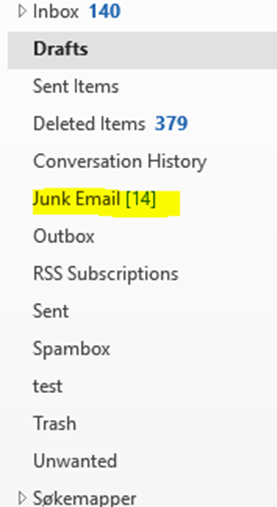 All messages marked as spam will appear in your Junk Email folder with title “SPAM DETECTED». Right-clicking on any message allow you to decide which messages are junk. This will block the email address and move the email into spam folder. This option will whitelist the email address and future emails into user’s inbox rather than their Junk Folder. This will whitelist any emails received from an email domain. Any future emails from that domain will be added to the inbox rather than going to the Junk Folder. This option will whitelist the individual email. It is possible for a similar email to still get marked as spam. This allows you to change the some settings for Junk Email policy. This entry was posted in IT-documentation, IT-information and tagged E-mail, Outlook, Spam on September 29, 2017 by Vaktmestern.